A great makeup look is all about beautiful skin and a great base or foundation is so important. Before anything else your skincare routine is the most important for a great base. You can see my skincare routine here and once you have a good skincare regime it is all about choosing the right foundation. 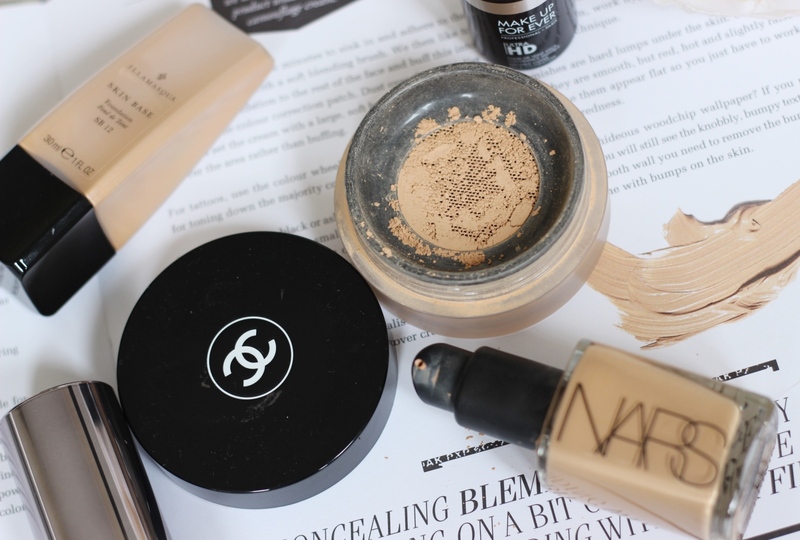 Your foundation should look like the best version of you and natural. Even if you are conscious about acne scarring or breakouts, these can be covered with concealer but your base can still look natural and like your skin but better. Choosing the right foundation can be tasking especially when there are so many different foundations to choose from. 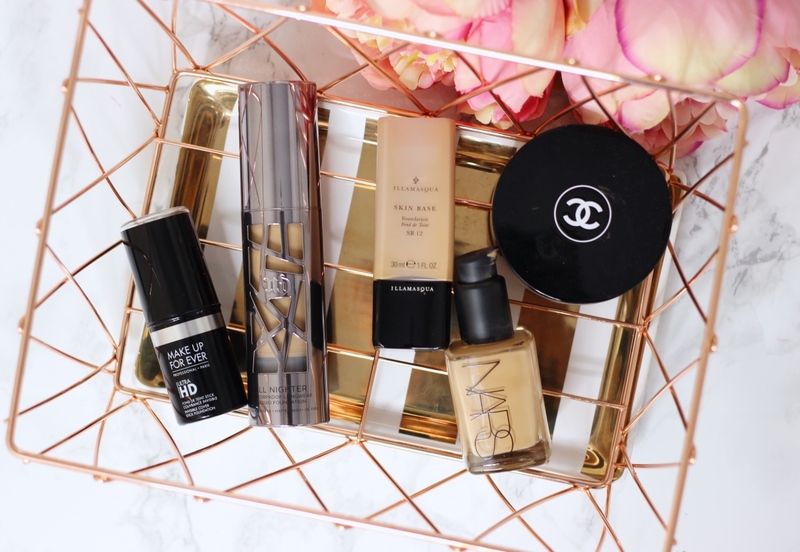 There’s liquid, stick form, powder, sponge, tinted moisturisers, BB creams… oh the struggle is real! On top of that there’s matte, glowy and then the type of coverage you want. It can be quite overwhelming! I’m going to attempt to break it down for you. The first thing you need to decide is what type of coverage you want, it may be that you have an every day foundation which is more lightweight and then a full coverage foundation for special occasions and parties. I prefer to wear a tinted moisturiser or BB cream daily, when I have breakouts I build up the coverage or add a little more concealer. Obviously primer is a must but I’m not going to keep going on about that! If you feel like you need a little bit more than a tinted moisturiser then I’d opt for a lightweight foundation for every day. Most lightweight foundations are buildable so you can layer them on and add more coverage if you need. Whether it’s a lightweight foundation or full coverage the same tips apply for choosing the right foundation. Going matte or glowy is just down to personal choice. Generally people with dry skin avoid matte foundations as they feel more drying and people with oily skin prefer matte foundations. Then you have those lucky people in between who love both! An important thing to remember is that everyone’s skin is different what works well for one person may not work as well for you. I prefer a matte finish but I love the NARS sheer glow and just powder over it for a matte look. 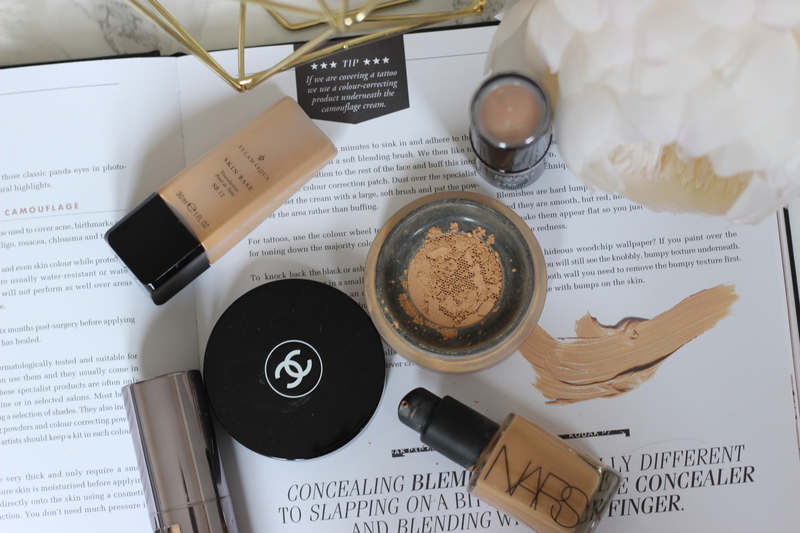 So there are things you can do to enhance your foundation. The job of your base or foundation is to look like your skin but better (I know i keep saying this!) it should even out your skin tone and make you skin look brighter (not lighter.) This is important to remember when you are getting colour matched. Generally olive and Asian skin tones want a yellow based foundation, something with a pink undertone is going to make you look washed out and grey. Very pale skin tones will need a pink undertone. I used to make the mistake of going for a lighter (pink under toned) MAC foundation and now looking back at pictures my skin genuinely looked grey compared to when I wasn’t wearing any foundation at all! When you are being colour matched or colour matching yourself choose the three shades you are instantly drawn to (these will usually be the closest to your skin tone) matching on the back of your hand or wrist is not going to help. You will need to try the foundation on your jawline. The best thing to do is swipe the three different shades on your jaw line, then step outside and have a look in the sunlight (department store lighting is not natural!) The shade that sinks into your skin is your shade, not the shade lighter and not the shade that ‘gives you some colour’ that’s the job of bronze and highlight. If I am in between shades I tend to just look for another foundation but that’s just my personal preference. I also always ask for a tester pot or sample in my shade (they should give you one!) so I can go home and apply all my makeup just as I would with the new foundation. This way I can judge exactly how it looks, applies, sits with my other makeup and how long it lasts. It is very hard to judge a foundation when you only have two minutes at a makeup counter and the sales assistant is trying to make a sale! It’s too much pressure and this is a decision you need to take your time with. If it works well for you and you have been colour matched correctly, the sales assistant will be more than happy to see you when you go back to purchase!